The Electric Production Car Series will use race-prepared Tesla Model S P100D cars. LONDON -- A new Tesla-based Electric Production Car Series for Europe has been officially sanctioned by Formula One's governing body, the International Automobile Federation (FIA), organizers said. 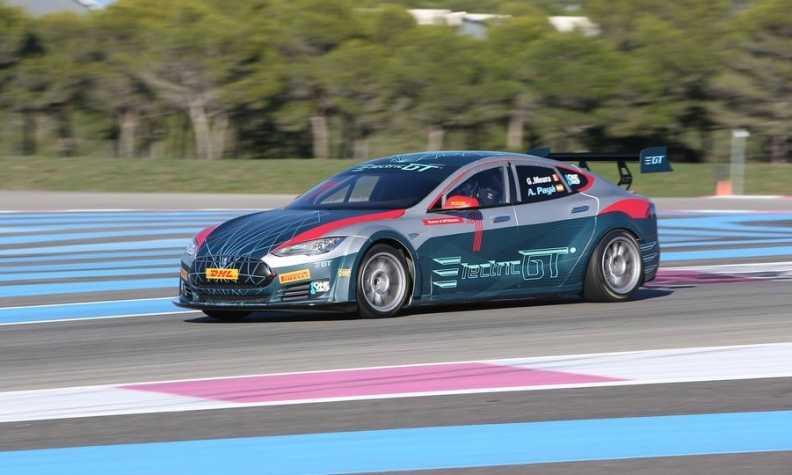 Electric GT Holdings said in a statement on Thursday that the first EPCS championship would start in mid-2018, with races around Europe, and involve up to 20 drivers competing in race-prepared Tesla Model S P100D cars. The car passed its official FIA crash test in Barcelona last week. Rounds will include 60km (37 mile) day and dusk races, with race power set to a maximum of 585kW (778hp). There will also be eKarting and eSports rounds. "We respect the FIA and we are honored to have their support ahead of our inaugural season," said Electric GT Holdings CEO Mark Gemmell. The FIA also sanctions Formula E, the first all-electric racing series, which is now in its fourth season and attracting increasing manufacturer involvement. Formula E is planning a production-based electric series to start up later this year with cars based on Jaguar's I-Pace performance SUV.